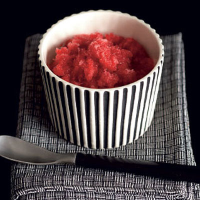 The secret of a proper granita is patience. The freezing and scraping, which needs to be done by hand, sounds laborious, but it’s not difficult and the reward is a wonderfully refreshing and intensely flavoured ice: once tasted, never forgotten. Put the cherries in a pan with 350ml cold water, bring to the boil and mash to release the juices. Turn down the heat and simmer for 30 minutes with the lid half on, mashing occasionally, till the fruit is soft and the juice has reduced by a third. Strain, reserving the juice and discarding the solids. Meanwhile make a syrup with the sugar and 400ml water in a heavy-based pan: heat gently to dissolve, then simmer for 30 minutes until reduced by a third. Allow to cool. Combine the cherry juice with the sugar syrup and stir in the lemon juice. Pour into a clean baking tray – the depth of the liquid should be about 3cm, so you’ll probably need 2 trays – and leave in the freezer for 30 minutes. Scrape the base and edges into the soft middle, work for a moment to blend, and freeze again. Repeat the scraping every half hour till the mixture is firm enough to form a spoonable slush; 3–4 stirrings will do the trick. Don’t be tempted to drop it in the processor as it’ll make it too runny. Add the vodka and scrape to blend. Either serve immediately in small bowls or transfer to a lidded plastic container or freezer bag and store in the freezer (take it out 20 minutes before you want to use it and give it another scrape as soon as it softens). If you leave it in the metal tray, it forms ice-crystals rather than slush.